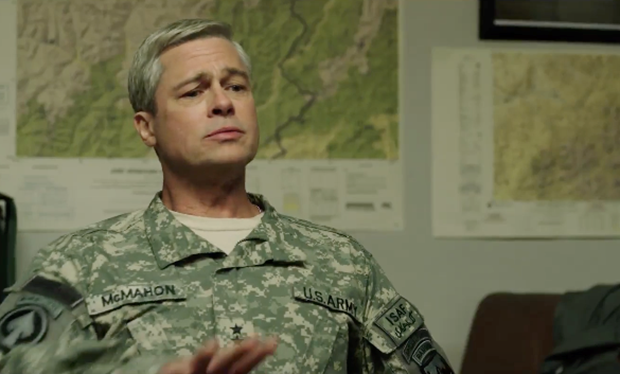 A satirical action movie where Brad Pitt stars as Gen. McMahon ready to deploy a campaign in the chaotic Afghanistan. It’s truly the dawning of a new entertainment world as Netflix is producing comedies, kids’ series, TV dramas, stand-up comedy specials, and theatrical feature films captivating audiences all over. That unwavering success continues as Netflix released the long-awaited trailer for Brad Pitt’s newest movie, ‘War Machine’ this past Wednesday. ‘War Machine is the upcoming satire on the war in Afghanistan based on the best-selling book “The Operators: The Wild and Terrifying Inside Story of America’s War in Afghanistan” by the late journalist Michael Hastings. Joining Pitt in ‘War Machine’ is a stellar cast including Tilda Swinton, Sir Ben Kingsley, Anthony Michael Hall, Topher Grace, Will Poulter, Lakeith Stanfield, Emory Choen, John Magaro, RJ Cyler, Alan Ruck, Scoot McNairy, and Meg Tilly. Brad Pitt will also serve as producers along with Ian Bryce, Plan B’s Dede Gardner and Jeremy Kleiner. ‘War Machine’ will be available on Netflix, May 26th.